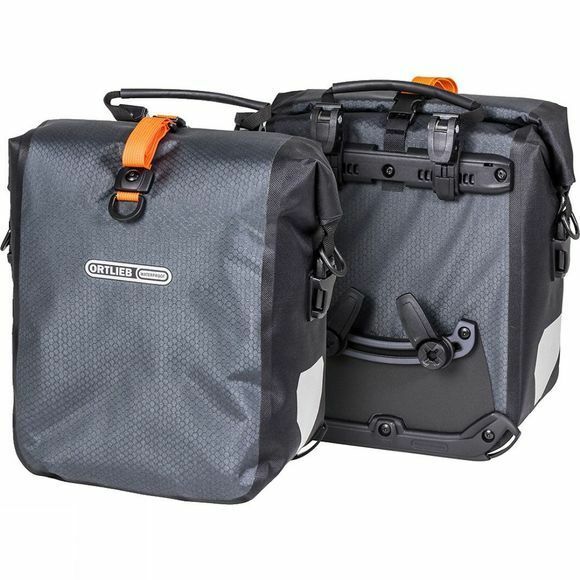 ORTLIEB‘s Gravel-Pack is a set of lowrider bike panniers for all bikepackers requiring more space for further equipment. The pannier pair with 25 L volume features the QL2.1 mounting system with additional mounting hooks for safe mounting to the carrier, allowing the gravel-grinder, mountain bike or fatbike to ride rough trails. The lightweight abrasion resistant material of the bike packing series combines sturdiness and weight reduction. Mounting to the lowrider ensures an extremely low centre of gravity on the bicycle despite a lot of luggage. This will allow you to bring along some "luxurious” extras. The roll closure of the waterproof panniers ensures that your gear stays dry even under tough conditions. The Gravel-Pack is PVC-free and made in Germany. In combination with ORTLIEB‘s further bikepacking series it is the perfect gear for micro adventures, self supported races or the next adventure.